Recommended hotels are easily accessible from I-495, the major highway linking Long Island to New York City. I-495 is also known as the Long Island Expressway (LIE) and is the most convenient road to use for travel to BNL by car from most hotels. See map for more details. Renting a private car at the airport is strongly recommended. There are few public transportation options from major airports to Long Island and BNL. More information about car rentals is available on the airport websites (La Guardia, JFK and Newark). You can also rent cars with online travel agencies such as Expedia, Orbitz, Travelocity, etc. Some local hotels, including Hampton Inn and Springhill Suites, have limited shuttle service to/from BNL. The shuttle vans are capable of transporting up to ~10 people each and are available for single ride to BNL in the morning, and another ride back to the respective hotel in the afternoon. Shuttles may be available at other times (for example, between hotel and local restaurants during the evenings), and participants can inquire and make arrangements directly with hotel(s). If applicable, ensure that you arrange and schedule a visit with RACF before planning your trip or arriving at BNL. Upon arrival at the BNL main gate on your first day of visiting, inform the security guard that you are visiting the RACF in Building 510. The security guard will ask you to drive over to the BNL check-in trailer, where you must present a photo ID to the security officer to verify that you are on the list of expected guests. Acceptable forms of photo ID are driver's license (or other goverment-issued photo ID) for US citizens, and passport for non-US citizens. You will receive a temporary badge that allows you to access the BNL site for that day. Please show the temporary badge to the security guard before you drive away. If applicable, you should also receive a temporary parking permit for your rental car. Ask the security officer for a permit if you are not offered one. 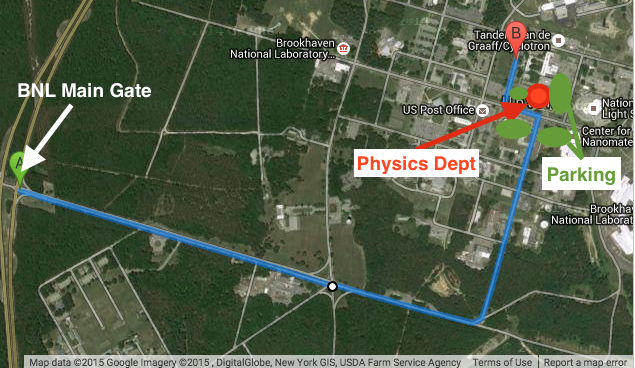 To reach the RACF, which resides within the Physics Department building: upon arriving at the main gate, enter the right-hand lane and follow it through the stop light and all the way around a bend to the left. 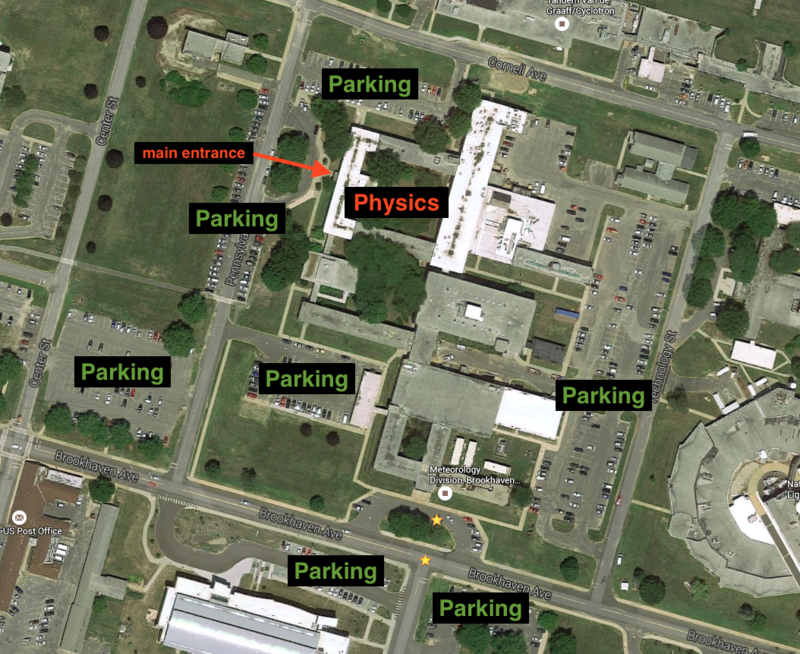 As the road comes to an end, you will be facing the Physics building; parking can be found to the left, right, and across the street from the building. 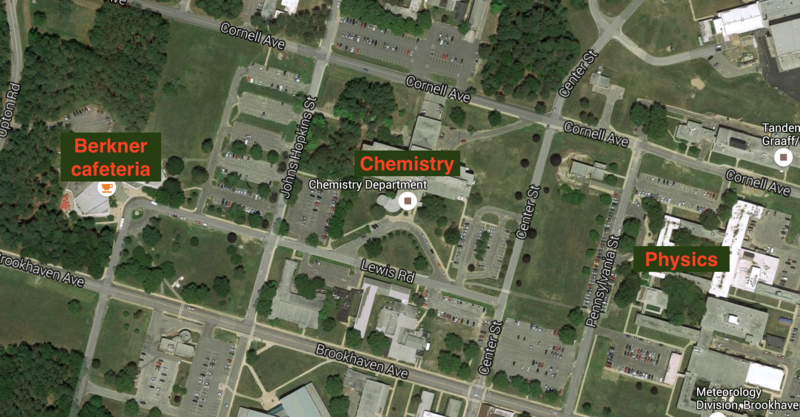 An additional map of the BNL campus and the location of the Physics building is available here. You may also request a copy of the BNL site map at the check-in trailer. Participants can go to Berkner Hall (the BNL cafeteria) for lunch (5 minutes walk from conference venue). You may park at any properly marked parking area, except those restricted to administration, handicapped, service or emergency (fire/police/ambulance) vehicles, which are clearly marked. Residence Inn: Newly built hotel near exit 62 of the Long Island Expressway (LIE). Hotel is 13 miles west of BNL (17 minutes by car). All rooms are equipped with a full-service kitchen (refrigerator, microwave oven, stove, plates, silverware, etc). No shuttle available to/from BNL. Quiet location with a few restaurants within walking distance. Hampton Inn: Modern hotel at exit 63 of LIE. Hotel is 11 miles west of BNL (16 minutes by car). Hotel is undergoing partial renovation. Limited (free) shuttle to/from BNL. Hotel is located close to major roads (Route 83 and the LIE) and is close (with private car) to restaurants in Farmingville, Patchogue, and Selden. A few restaurants are within walking distance. Fairfield Inn: Small, modern hotel at exit 64 of LIE. Hotel is 10 miles west of BNL (14 minutes by car). No shuttle to/from BNL. Hotel is located on a major local road (Route 112) and is conveniently close (with private car) to nearby restaurants in Medford and Patchogue. A few restaurants are within walking distance. Springhill Suites: Newly built hotel near exit 65 of LIE. Hotel is 8 miles west of BNL (13 minutes by car). Limited (free) shuttle to/from BNL. Hotel is located in a quiet, industrial park setting with very few restaurants within walking distance. Additional hotels can be found on BNL's Hotels page. A short list of other nearby restaurants recently patronized by the RACF staff and found to provide quality meals at an acceptable price is shown below. In all cases, we recommend Google maps or GPS for driving directions, if you are not familiar with the local roads. Please remember the difference in voltage standards between countries when traveling: the standard voltage in the United States is 120 volts (60 Hz frequency, plug type A/B), which requires an electrical outlet adapter adapter when plugging in electronics from many other countries.